Yoshi dove into the world of dance music by starting to DJ in 1991. From then on, he went on work as the house music buyer and sales clerk at the renowned record store in Shibuya, Dance Music Records, selling not only the hottest NY deep house but also introducing rather early in Japan, the then, up and coming house sounds coming out of the U.K. and Europe to the top DJs in Japan. In 1997, he decided to expand his horizons and actually produce music and joined one of Japan’s premier dance music record label, Flower Records, headed by Eitetsu Takamiya a.k.a. Little Big Bee, where he acted as their A&R, promotions head and sales chief. This might be where many started hearing his name. As Flower Records’ main guy, he steadily promoted their incredible stew of domestic acts such as Su Paka Pooh, Little Big Bee, Jazztronik amongst others, to the level that it is universally known now for. To note, around the same period, with the recommendation by DJ Cosmo, he began writing disc reviews periodically at The Loft, David Mancuso’s website column, ear candy where his eloquent taste of dance music became quite renowned throughout the world. 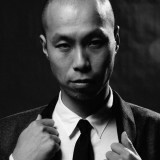 In 2003, he went independent and started doing an assorted variety of work in the dance music field such as promoting domestic and international labels and artists in Japan such as Franck Roger, Raphael Sebbag of UFO, Kenichiro Nishihara amongst others, license coordination and bookings. From 2005, he began promoting the French label, Kitsune and helped to establish their presence and popularity in Japan. In 2010, he set up his own record label, UNKNOWN season. A label that releases credible, electronic, house, tech-house ambient tracks produced by up and coming as well as established, high quality Japanese creators to the world. With Yoshi’s trustworthy taste in music and knowledge of nurturing acts, this label’s quality has not gone unnoticed and has received regular praise and confidence by some of the top DJs such as Jimpster, Laurent Garnier, Juan Atkins, Joris Voorn, Satoshi Tomiie, John Digweed, James Holden, Tensnake, Osunlade, Danny Howells, Sebo K., Stacey Pullen, Brothers Vibe, Guy J, DJ Sneak, DJ Alfredo and DJ Nature. He also regularly hosts a mix show called “UNKNOWN season Radio Show” at West Radio in Greece (www.westradio.gr) which is aired every last Sat., 7:00 AM (Japan time/ 6:00 AM Summer Time) so tune in to his and his crew’s delightful sounds. His release of original producing was "Fallin' House" with Break 3000(Dirt Crew) from V.A. "Deep Love 3" out of Dirt Crew Recordings 2013 Aug. And also remix of Werner Niedermeier & Gareth Whitehead’s track, Blaq (Yoshi Horino Remix) out of WiN Recordings was given the heads up by Dirt Crew, Silicone Soul, Pig & Dan, Luciano, Bookashade, Sasse, amongst others. his recent release 2014 "Sweet Memory EP" out of Asia Music was given the heads up by Sasha, Lars Behrenroth and many more. "Good Vibes Herer" by Sasha. Currently, he is busy producing, running his label and DJing regularly to help spread the auspicious sounds and vibes coming out of Japan, via UNKNOWN season. Therefore, he is focusing again now in DJing more and is planning an Asian and European Tour in the near future.